Maple with notched ebony top for tenor and plectrum banjos. 1-3/8" string spacing. Fixed a tenor banjo lying around, bought a couple just in case I needed to shave anything down. Price was right and they work just fine. Worked well on a 1930's Tenor banjo. Need a 1/2 inch one though. Great bridge. My hounddog ate it,he liked it to. My recent order of several parts for my father's antique banjo came as it should have. All the parts were excellent, and fit well. I always know when dealing with Stewart-Mcdonald there will be no problems. The consultant I ordered through was knowledgeable, professional, and courteous. Something that can always be expected from Stew-Max. J.S. 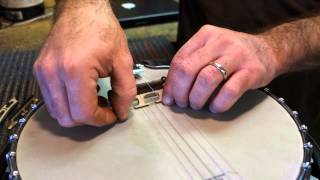 Exactly what I needed to set up my vintage banjo uke. Quality product and fair price. At this price, there is no reason to hand make a banjo bridge- these are excellent quality and ready to go.